The Z film has always been a valuable piece of evidence in the case. Unless I'm overlooking it, can someone take a moment to explain what it the point of this thread? Thank you. A valuable piece for whom? If you are interested, take the gif and count the total number of frames. Compare it (frame count) to the same segment in the extant Zfilm? Minus your preconceived notion that the extant zfilm is authentic, what major difference is there between the two? I know this is subjective, but its always seemed to me that the two vehicles (plus that single cycle towards the left, were on some sort of "optical trolley" that was worked on separately and then inserted (i.e., re-inserted) into the larger picture. Back in 1965, there was a "special effects" seminar --open to the public--given here in West Hollywood; and some expert (from the film industry) was lecturing on how "special effects" (at the time) were synthesized. The movie used by the lecturer--probably someone very well known at the time--was Androcles and the Lion (1964) starring Audrey Hepburn. Decades later, I still remember the talk about the 'optical trolley'. Projected on screen was film, with a black patch of some sort, that needed special artistry to create. Then that item was "inserted" into the area where the black patch was located. The lecturer demonstrated how Aurdey H. and "the lion" appeared "together" but were in fact created separately. Everytime I see the Z film with the two cars following each other with such precision, I think back to that evening. I wish i had the program, and the name of the "high tech" speaker---"high tech", at that time. I have been thinking about an opportunity that exists from the recent filming of the JFK ambush conducted in Dealey Plaza for the Stephen King mini-series '11.22.63' for several skilled JFK researchers to work together or separately on providing global answers to many of the riddles the JFK assassination presents. The King film crews involved shot a lot of film of the replica JFK parade car & the SS Queen Mary with actor stand-ins representing the JFK entourage & the SS agents plus two JFK assistants in the Queen Mary that was not used in any of the 8 Episodes shown on Hula. The actor stand-ins is what's been missing from previous ambush re-enactments in addition to having both the JFK parade car & The SS 'Queen Mary' both present on site. The King filming involved the JFK limo & Queen Mary clones' travel towards the TSBD from Houston Street, the Elm St. intersection left turn and the brief trip down Elm going into & out of the 'tunnel' created by the triple overpass. Filming was conducted from many vantage points in Dealey Plaza, including the 7th floor S/E corner window (one floor above the alleged 'sniper's nest': the same spot Oliver Stone used for his film 'JFK'). My question to you is this: If Mr. King (or Oliver Stone) were to make available to you & others (by posting it on the Internet) the film footage they shot from the 7th floor of the TSBD of the agents in the Queen Mary (that was tailgating JFK's parade car), could you (or others) determine mathematically where the alleged shooter would have to be aiming his rifle to achieve the hits that he made (taking into consideration how the FBI determined the alleged murder weapon was firing 'high & to the right')? Could you (or others) determine with math if the agents or their transport car presented an obstacle to a clear line of sight from shooter to the impact point on JFK's head (with special focus on the Queen Mary's windshield height, length & width plus the two SS agents standing on the right running board & Clint Hill attempting to board the rear bumper of the JFK parade car)? Could a computer animator (such as Dale Meyers) use that footage & your math (or others) to include the SS agents & their vehicle in his well known JFK ambush simulation that was first broadcast to the public on ABC's Peter Jennings narrated TV documentary 'Beyond Conspiracy' that doesn't feature them? IOW, could Mr. Meyers fix his animation's faults with yours & Mr. King's help (or others)? 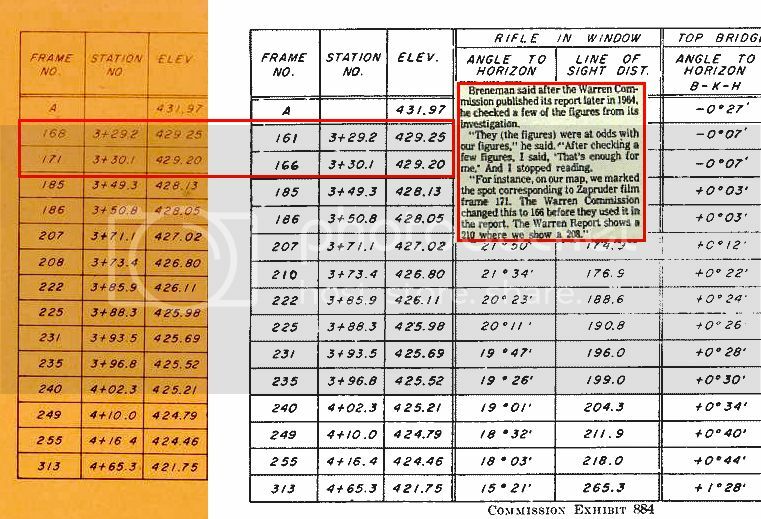 If it can be mathematically proven that no blockage existed from shooter's weapon to JFK's head at z-313, I'm wondering if your math (based on Stephen King's film footage) could tell us with accuracy just how much clearance the bullet that killed President Kennedy had when traveling over the Queen Mary's front seat passengers, running board riders, windshield, long, fat hood & front fenders? By having film footage shot from the upper floors of the TSBD of the JFK parade car & SS Queen Mary clones correctly positioned on Elm St. (starting with the z-313 location) with actor stand-ins included, could you (or others) fix the errors & deceptions Hoover's FBI & Rowley's SS made by using the wrong car to represent JFK & his real vehicle & excluding the SS car & agents from being factored into their re-enactments published in the WC & seen on the 1964 SS reenactment film? Do today's JFK researchers have all the visual tools they need to completely start from scratch the original & subsequent Government ambush re-enactments? What more would be needed? PS: I'm thinking of Robert Prudhomme's research efforts & yours also in past collaborations concerning the marksmanship facts & puzzles of the JFK ambush as I'm writing this. I am visualizing a scared person quickly pointing a rifle out of a window & firing it in the general direction of body mass, without the use of a scope or fixed sights, as well as using those tools & aiming low & left to achieve the impact points that were achieved in the shooting allegedly from the TSBD 'sniper's nest" half-opened window. I am visualizing a shooter from the TSBD 6th floor S/E 'sniper's nest' half-opened window having his rifle barrel pointed at a point somewhere around Clint Hill dashing towards the rear bumper of JFK's parade car (as JFK is falling forward & to his left), squeezing the trigger, with the bullet traveling high & to the right & colliding with JFK's head & killing him instantly as I write this....I believe your math (and others) can tell us if this occurred or not. Chris, you already know what a dummy I am when it comes to math (I failed Calculus 3 times in college). I bring this to your attention because I have complete faith in your math & reasoning gifts; if you were to tell me that I owed you money for a 5 dollar burger & I had given you a ten, I would not argue about it (lol). Nowadays, filming from the 6th floor SE window appears to be prohibited. I don't see that changing in my lifetime. It might be possible to partly fulfill your request with existing material. I have also wondered if it was possible to create what I supplied in gif form, back in the early 60's. In the attachment provided, I assume this process (red box) created duplicate frames, not "in between" frames as the filter created. I have some other ideas pertaining to post-production, for another day though. The difference would be .9ft which equals the total distance traveled from z161-z166 in extant CE884. 'Nowadays, filming from the 6th floor SE window appears to be prohibited. I don't see that changing in my lifetime. We're thinking along the same lines, Chris. Perhaps overlaying the Queen Mary from WC photos with the white Lincoln used in the SS re-enactment film at the z-313 location might do the trick for some. It's better than the Government of those days pretending the guards & their car were not present during the ambush; it would give today's JFK enthusiasts & students an idea of what obstacles may have been present to a TSBD shooter 53 years ago & if the JFK 'kill shot' was possible or impossible to make from that alleged sniper's window at Z-313. That may be the best JFK researchers keeping the interest in the case alive may be able to do with the tools they have to presently work with. I do know after the completion of the 11.22.63 mini-series Dallas filming (that caused a bit of an uproar over traffic jam problems), several film combos appeared on YouTube of the various filming spots that captured the motorcade ambush re-enactment. There was an amazing amount of footage taken of what was cut down into what looked more like a brief music video. My 1st thoughts on that footage was wondering how many JFK researchers that footage could help in their various areas of expertise. Unfortunately, missing from that series is the most important view of all (IMHO): what an alleged TSBD shooter should have seen with the Queen Mary practically on top of JFK's limo with actor stand-ins in both cars. There was no TSBD 7th floor line of sight to the Elm St. motorcade footage put on YouTube at all. Hmmm...I wonder why. Stephen King's motorcade ambush re-enactment was unique in that it contained both JFK & SS car clones plus actors representing the actual persons involved in the shooting. Most re-enactments just use a JFK parade car clone & (like Hoover & Rowley's boys) omit the Queen Mary & its SS agents. I can't help but wonder if shady operatives held a gun to King's head & confiscated his 7th floor TSBD looking down to the Elm St. kill zone footage. It's possible, I suppose: stranger things in life have happened (lol). Who else but an organization well known for assassinations & drug running (that many globally suspect murdered President Kennedy 53 years ago) could take a piece of its own US Presidential 'kill zone' & turn it into a money making business, charge patrons the better part of 20 bucks & not let them look out the 'kill window'? The distance from extant z313 to the Altgens shot at 30.856ft farther west. .18ft per frame difference within the extant CE884 z161-z166 span. How many frames tying these two distances together? You can continue to measure distances, create animated GIFs, and use all kinds of mathematical formulas and calculations but it's not going to prove anything. In other words, you're reaching for something that isn't there. When Zapruder shot the film that day, there were 18.3 frames of 8mm film stock going through his camera's gate and being exposed to light. And that's the way it's been ever since. Today, when the film is transferred digitally and if you encode the transfer in a digital editing software like Adobe Premiere, and then export the timeline to 30 fps, you're going to have extra digital frames in the digital file. But it doesn't change anything - yes there are extra *digital* frames but when you view this file, you're still seeing the same Zapruder film that was recorded in his camera. But nothing sinister has taken place during this process. 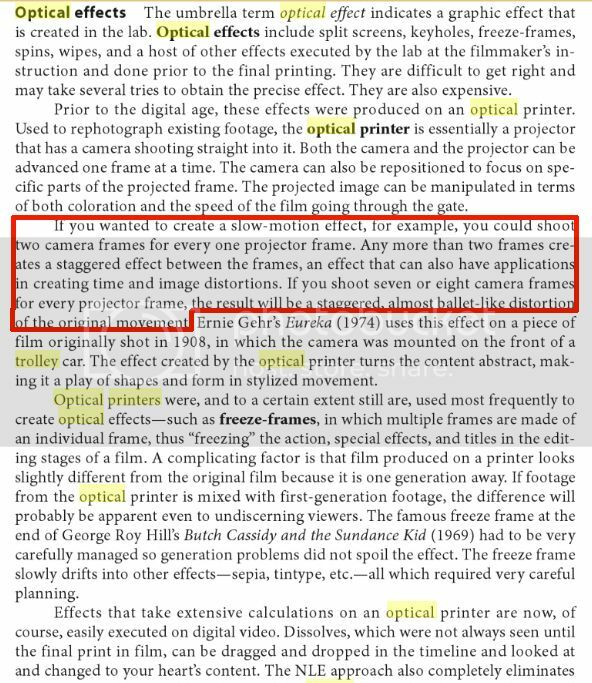 Yes, optical effects have been around for years and are the forerunners to digital effects. Keep in mind, though, that there really was no need for the government to manipulate the film. The reason is simple - it was snatched up immediately by Life magazine, who shared it only with government officials, and kept it out of public view for 12 years except for the odd frame here or there. This is the SS's reenactment film of the assassination and at that mark above, you'll see the Z film in black and white. When they made this film, the Z film was never to be shown to the public, but they did include it in this "eyes only" reenactment film. Watch the Z film carefully in it. Except for it being in black and white, it looks *exactly* like the Z film we have in our possession today. There's nothing sinister about it; there's no special Rosetta Stone in it. This proves, and should prove once and for all to those who continue to believe in alteration, that the Z film has not been altered. No people, objects, guns, or sewers were magically erased from its frames; no magical extra frames were added to it to change its outcome. This is what I meant by the Z film being one of the most important pieces of evidence in this entire case. The true value of the film is it shows us - the public - things they didn't want us to see, like the head being thrown violently backward; the throat shot, then the back shot, then Connally reacts to his shot. By suppressing it, the lawyers could go to work and come up with the ridiculous Single Bullet Theory to keep everything neat and tidy (Oswald did it alone). And it's for this very reason that the government suppressed it for so long. And it's also why the media started its disinformation campaign on behalf of the government, especially when Dan Rather got on live TV and described the film on 11/25/63 and said the fatal shot pushed the president's head downward, never once mentioning the violent backward movement. Sure, Dan, sure. Now think about that for a minute. If the government was really trying to vigorously pursue the truth of this case, why not just show the film in its entirety to the public right then and there? Why not show it and then have Rather or Cronkite, upon showing the Z313 part and honestly say, "...then the president's head is thrown violently backward and to the left of Mrs. Kennedy." Instead, Rather, CBS, and the government lied about what they were seeing in the film. And then years later, during the uproar when the public finally got to see it, they started coming up with crazy alternative theories like the jet effect and so forth. It's much, much easier to suppress and manipulate the evidence to fit a foregone conclusion than it is to try to edit film frames the size of a pinky nail with 1960's film editing technology. And how do we know that? Because we now get to see what the government was seeing mere months after the murder in the above SS version of the Z film. I encourage you to read the story below, which I found from another member on this forum. "...only four hours after the murder, Life magazine grabbed up one of the main pieces of evidence--the Zapruder film-- misrepresenting the content to millions of readers in its very first post-assassination issue and then continuing the lie with ever-changing captions and Zapruder frames in its special issue supporting the Warren Commission report..."
Please don't misinterpret the above quote. It does *not* mean the Z film itself was altered. What it does mean is, like Rather did on CBS, the government and media were not telling the truth of what the film was actually showing. 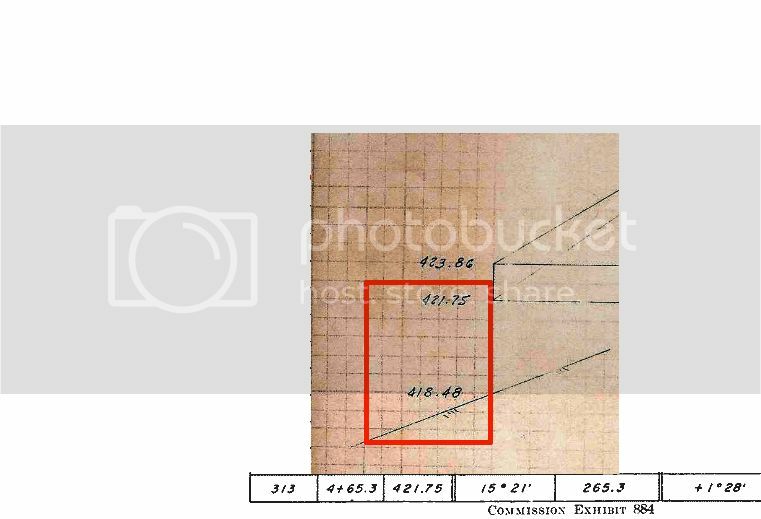 The extant film shows it should have traveled 5.4ft/6.3ft in the same span. Where are the frames reflecting the missing distance? There is a 10" vertical difference between the sniper's perch boxes and the windowsill frame . Once again, what's up in the window has to sync with what's down on the street. In post 50, I show the speed of the limo as it pertains to the extant zfilm by plotting it. Remember, 1ft vertical = 18.3ft horizontal. 5.4/18.3= .295 x 12" (1ft) = 3.54"
10"+ 3.54" equals a combined distance of 13.54 vertical inches. I just made a GIF of frames 154-166. All you have to do is watch the little girl running in the upper right corner (I think her name is Rosemary). She runs very smoothly in this GIF - no jumps...no hidden or missing frames...no stutters. The car is basically gliding down Elm Street at a constant speed, again, smoothly and like it should. Also, look at the guy taking pictures and he has one leg on the street and then steps back onto the curb (near the girl). Again, smooth motion. You can see another clip similar to it later at 3:16. So I'm not sure where you're going with this thread. There were no alterations made to the Zapruder film. If you want me to make another short GIF of frames elsewhere on the film, let me know.